It is a proprietary anodizing chemical additive utilized in sulfuric acid anodizing electrolytes to improve the performance of the resulting anodized surface and facilitate the anodizing process itself. The additive is specially formulated to prevent the aluminum from burning during the anodizing process. Decreasing the tendency for burning allows a high quality, uniform oxide to form even when anodizing at higher current densities which, in turn, decreases the anodize time and allows for increased production. Using AA-200 during anodizing has been proven to produce a harder, more dense and consistent coating. 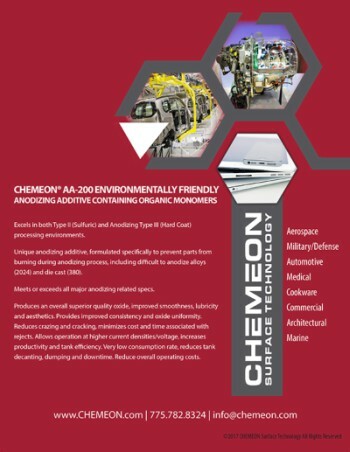 In addition to offering AA-200 as a stand-alone additive, CHEMEON also offers the "CHEMEON AA-200 Anodize Process", which combines the benefit of the AA-200 additive with process control elements to succeed where conventional anodizing fails. For example, the CHEMEON AA-200 Anodize Process Technology was licensed to VISTEON Automotive for use on the revolutionary slip in tube (“SIT”) drive shaft for Jeep Grand Cherokee. The CHEMEON process was required to pass tests necessary to convert this part from steel to aluminum for the first time ever. CHEMEON is jointly listed with VISTEON Automotive in the U.S. patent for this particular application. Applications	 Anodizing Type II (Sulfuric). Anodizing Type III (Hard Coat). Industry Specifications and Standards	 MIL-A-8625 F. ASTM B 117. ASTM B 680-80. ROHS. REACH. WEEE. ELV. Product Advantages	 Superior corrosion protection, hardness, and abrasion resistance. Improved consistency and uniformity of oxide. Improved resistance to burning. Operation at higher current densities. Improves efficiency - reduces decants. Superior quality, smoothness, and lubricity. Reduces overall operating costs. Build-up Rate	 Better control, analysis, and slower rate of aluminum bath anodizing build-up Customers previously decanting every 3-4 weeks report reducing that to 6-12 months between decants. Sealing Quality	 Meet or exceed ISO 7599 specification in all cases.